I have three autistic children, along with three who are neurotypical. They were all born within a 12-year period. As you might imagine, our family household was a wild and crazy 20-year rollercoaster ride as they were all growing up. I, through desperation, trial and error, magical luck, and vivid imagination, came up with what I call my seven autism household life hacks. Many of my children’s therapists, teachers, and care providers have encouraged me to share them with other autism families, as they work so well for my children and others on the spectrum. Now, as my two middle (neurotypical) daughters work with children with autism themselves, they use these life hacks with their charges. The Lost Fairy is a sister of the Tooth Fairy. She comes and takes things you lose and can’t find. She will not bring them back until you have stopped looking for them and forgotten about them. She will also not bring them back if you’re having a meltdown. This works “like magic,” one might say. All three of my children with autism struggled with getting bogged down and having meltdowns over things they misplaced. After going through a standard grid pattern search, like we were archeologists looking for ancient pottery, we often still could not find the important misplaced item. Once I developed the Lost Fairy story, the kids would accept that the Lost Fairy had it. If I was able to later find it, or buy another one just like it and secretly scuff it up to look like the original, then the Lost Fairy would leave it beside the bed while they were sleeping. This worked wonders, though a couple of times the Lost Fairy brought new one back, then a month later the original was found, but I was able to explain she must have gotten lost, as she was of course known to do, and mistakenly had given us some other little kid’s item back. In the cases where I could not find it, and it was irreplaceable, whenever the child recalled and asked about it again, I’d simply say that we hadn’t forgotten about it yet for her to bring it back to us. That fairy has lots of stuff from our household to this day. My two daughters with autism both struggled with picking and scratching their skin keeping wounds open for months at a time, and leaving scars even when they would let one heal. My youngest even picked out her finger and toe nails regularly. After several different coping and distraction techniques (rubbing instead of scratching, keeping them covered with bandages, wearing a rubber band on the wrist to pop instead) failed, I came up with “Weird Powder.” I called it that because my youngest, when asked why she picked a nail off or a wound open, would say only that it had been weird. One night when she was having a terrible meltdown and was claiming to be “weird all over,” I conjured up the magical “Weird Powder” and sprinkled it all over her. This was just the common brand of body powder in the golden plastic bottle that is medicated and tingles. The tingling is how you know it is working its magic. This worked unbelievably well. The weird powder had to go with her on sleepovers, vacations, and to summer camp, where many a camp nurse was amused by my explanation upon dropping the bottle labeled “Weird Powder” off in her bag of other meds. I wanted to call this the House Prime Directive, but that was bit hard to explain to the kids in their limited vocabulary, as they were all so little then and not well versed on science fiction, so House Rule Number One it became. The rule was only one person at a time could be freaking out. Also interestingly, when this did work, often times, when the first person was done freaking out, the one who had stopped because it wasn’t his/her turn would not freak out, which was a nice bonus, of course. There were plenty of times we broke House Rule Number One… but it was a goal that we aimed for, and it helped sometimes. It also made for comic relief when someone mid-meltdown would scream at someone having a panic attack that it was not their turn! Laughter is always good medicine, particularly in an autism household. We found it most helpful for the children to learn to say, “I am autistic,” when they were struggling with some social interaction, or being questioned as to why they were doing something unusual. Also, it can be even more helpful if they can learn to give their names and their caregiver’s name to say along with “I am autistic.” This developed out of my frustration with my first-born son who has autism and was often glared at or lectured by relatives, friends, or strangers. When people know a child has a developmental delay, they are much more accepting and understanding. I noted this in how differently children with Down syndrome were treated by strangers than children on the spectrum. After wishing I could hang a sign on him saying, “I am autistic,” every time we left the house, I taught him to say it. It helped with both the autistic girls later, and also helped their neurotypical siblings as well, as they would say, “My sister is autistic,” when they witnessed these incidents. My three children with autism are all verbal, and though they spoke much later than neurotypical children, they were able to say this within time. However, this hack could be used by nonverbal children as well by having them learn to sign it, or having them learning to point to a medical ID bracelet that says it. People on the spectrum are also more likely to have encounters with police if their behaviors are mistaken for being intoxicated, high, or resisting arrest. Saying, “I am autistic,” can literally save lives in these cases. This life hack is similar to the previous one, but for more difficult situations. It is more often used by caregivers but can be employed by the autistic person in dire need. There are times when you need to tell others what the situation is, when they are not just asking what is the problem, where the “I am autistic” hack works well. Alas, sometimes an ignorant, hateful person is being abusive, assaulting, and assuming the child is just a brat and/or assuming you are just a terrible mother/sister/caregiver. This took place mostly in grocery stores, but also at family gatherings, gas stations, and senior prom. This works so well to stop Nosey Nellies and bullies in their tracks. I’ve had to employ it over a dozen times…and never once had the kettle come up with an answer to the question. No one says you have to be polite to rude people attacking you or your child. When being assaulted, introduce the pot to the kettle. Most people on the spectrum have some obsessions upon which they fixate. My eldest son is obsessed with comic book super heroes. This has been so helpful. Telling him the X-Men will be disappointed if he misbehaves while seeing their new movie ensured he was a model movie audience member. Telling him to be fast like Superman when I needed him to hurry because we were running late worked like a charm. One of his Individualized Education Program (IEP) modifications was that when doing standardized testing, a new comic book would be placed on the blackboard in the front of the room while he did his test, and he was allowed to get it if he quietly took the test and turned it in on time. My youngest daughter is obsessed with animals. She was struggling with my grandmother’s death, and her grief therapist was making little progress with her as she began ripping out her nails and picking at her skin and even cutting herself, until the therapist started bringing her dog. She would talk more freely with the therapist and open up more as she played with the dog. Later, when she struggled with my husband and I divorcing when she was 13, she began to self-harm again until I got her a pet donkey which instantly solved her transition crisis. Alas, I had to take her out of school and begin to homeschool her, as she was being picked on so badly, and was very reluctant to do any studies with me at home. I am able to get her to do her school work by having her read books about animals, do math problems of animals, and getting her to write about animals. When she is having a meltdown or just is in a sad mood, going out to play with the animals in our barnyard, or having one of her cats lay down and take a nap with her always settles her down. Don’t be afraid to use those obsessions to get them to do what they need to do—whatever works! This is such good advice for raising any children, but alas, I see so many parents not employ this life hack. It is so easy to do, and helps so many situations. When my older autistic daughter was in kindergarten, I was called up to the school one day because she was having a meltdown. When I got there I found her sobbing and quivering on the floor with the staff petting and trying to hug her. I learned the problem started when she asked for a red chair. At this point in time, her obsession was on the color red. Her clothes were all red, her blankets and pillows were red, her plates and cups were red. See “use their obsession,” rule six, above. I looked around this kindergarten room. There were a couple dozen chairs, in the room, some blue, some yellow, some red. Several red ones. Instead of offering her a red chair, the teacher had demanded that she sit in the yellow one that was at her desk that day. This brought on this hour-long meltdown and my having to rush to the school and calm her down. I did that by nicely asking one of the little boys in the room who was sitting in a red chair if he would trade chairs with her. He said sure. Problem solved. Kindergarten teacher who had taught for 40 years thought I was horrible for giving in to her. Said teacher was wrong. There are plenty of things I cannot give to my children. I have to tell them no, they cannot ride in the car without a seatbelt on, which was one of the other things that caused that daughter to meltdown. She hated anything tight or binding so all her (red then) clothes were stretchy material, and loose…but I had to make her wear a seatbelt, so I had to fight that battle. I did not have to fight the red chair battle. Pick your battles. You will not spoil your child. There will be plenty of battles you will have to fight and say no to them. Saying yes, when you can, when it is no big deal, is not only fine but good. They need to win some battles too. Thank you so much for sharing this! I have three autistic boys under age 9, and it is so good to hear advice from people who have “been there.” I really appreciate your expertise and ideas. Thank you! Great article! My son is 8 and on the spectrum. It’s so nice to hear from people who have experience! Thank you!! Love this article so much! Such a sense of humor and pragmatism and self acceptance. I’m also a seasoned. 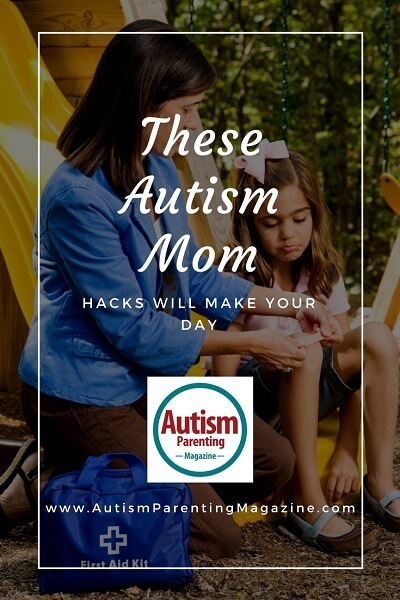 Autism mama and these hacks are original and clever and do-able. Weird powder and Lost Fairy crack me up!